In the present day scenario the World Wide Web (WWW) is an important and popular information search tool. It provides convenient access to almost all kinds of information – from education to entertainment. It also makes global information available at our fingertips. This problem of ‘long download time' is relevant not only to Web users but also to the authors and designers of websites, as websites that take a long time to download are rarely or less frequently visited. 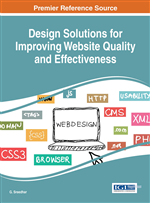 In fact it is felt necessary that the website shall adhere strictly the W3C guidelines to achieve optimum web design and promote quality of websites so as to make the website safer and user friendly and to address the possible reduction of down load waiting time of web pages. A case study with reference to the various Universities in India is discussed in this chapter and assesses the quality of web design about their status of Quality and user friendliness. Web Browser Tier: A Web browser is a software application that is used to search, view and navigate Web pages hosted by Web Server over the Internet. The end user requests a Web page by entering a URL in the address bar of the Web browser. The Web browser in turn sends the request to the Web server, which sends an HTML page back to Web browser. The end user then views the returned page. The Web browser acts as the client in the client/server architecture of Web server technology. Some of the popular Web browsers are Internet Explorer, Netscape Navigator and Mozilla. Web Server Tier: A Web server acts as a gateway between client and DBMS residing on the server. It is an application that serves Web pages over the Internet using the HTTP protocol. The HTTP is a Hypertext Transfer Protocol used by the WWW to establish client and server interactions. Web servers publish Web sites, maintain network traffic and manage user data. Web servers also help in incorporating the network hierarchy in a Web site. Some of the Web servers are Apache Web Server, Microsoft Internet Information Server (IIS) and Web star. Database Server Tier: Database access interfaces such as ODBC and JDBC are used to connect web applications with database servers. The communication between web application components may also flow through plain TCP sockets, Java RMI or CORBA. Architecture of Web application is shown in the following Figure 1. Growth of Internet Users: The Internet users have been growing rapidly. The growth rate of internet was increased year by year since 1990s. The Scholar Prof. Robert H. Jackon (2003) conducted the survey on internet users and he concluded how the number of internet hosts is increasing day by day. It is shown in Figure 2.